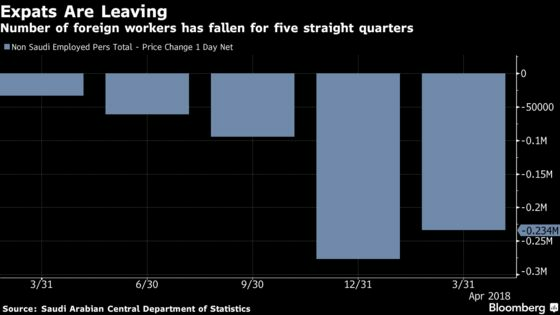 (Bloomberg) -- Saudi Arabia’s expatriate workers are leaving the kingdom by the thousands, and the exodus may not yet be over. As companies struggle with slower business and authorities impose more fees on foreigners, the biggest Arab economy is losing some of its allure to expats who once flocked to a country awash with petrodollars. The number of foreign workers declined by 6 percent to 10.2 million in the first three months of 2018 compared with a year ago, taking the cumulative drop over the five past quarters to about 700,000, according to official data released this month. The losses in the first quarter were in sectors including construction -- usually dominated by low-cost laborers -- as well as trade and manufacturing. But the data also show unemployment among Saudi nationals rising slightly to 12.9 percent, underscoring the struggle to create jobs as the economy slowly recovers from the worst economic slowdown since the financial crisis in 2009. Creating jobs for Saudis is a priority for Crown Prince Mohammed bin Salman, the driving force behind the country’s plan to reduce its dependence on oil. Under the National Transformation Program, the government targeted an unemployment rate of 9 percent by 2020, according to data on the website of the program. “We are expecting the rate of job losses for expats to remain elevated over the course of the year,” Mohamed Abu Basha, an economist at investment bank EFG-Hermes in Cairo, wrote in a report. He attributed the forecast to rising fees, efforts to nationalize jobs and the “weak” economic backdrop. The government started imposing a 100 riyals ($26.70) a month on expat dependents in July 2017. The fee is set to reach 400 riyals a month in July 2020. Gross domestic product grew 1.2 percent in the first three months compared with a year ago, the first expansion in five quarters, as oil prices increased. Private-sector growth, however, remained muted at 1.1 percent. As the kingdom emerges from last year’s recession, job creation will likely lag behind the economic recovery, said John Sfakianakis, director of economic research at the Gulf Research Center. Authorities, however, could relax some of the rules. According to Al Watan newspaper, the government may revise plans that ordered most retail businesses to replace all foreign workers with Saudis, reducing the percentage of nationals to 70 percent.